This week the city of Los Angeles sent a cease-and-desist letter to ride-sharing app companies Uber, Lyft and Sidecar. The city and Los Angeles Yellow Cab claim that these services are "rogue taxis" that are "bypassing all safety regulations created to protect riders and drivers." But this isn't the first time that this town has gone after the unregulated four-wheeled menace. This crackdown on unlicensed taxis in the City of Angels is nearly identical to a battle that raged a century ago — without all the iPhones and whatnot, of course. In 1914, an idea emerged in Los Angeles that would rapidly sweep the city in just a few short months: the jitney. Jitney was slang for "nickel" and for that low, low price (about $1.10 adjusted for inflation) you could catch a ride with a friendly Angeleno driver who would take you wherever you needed to go. 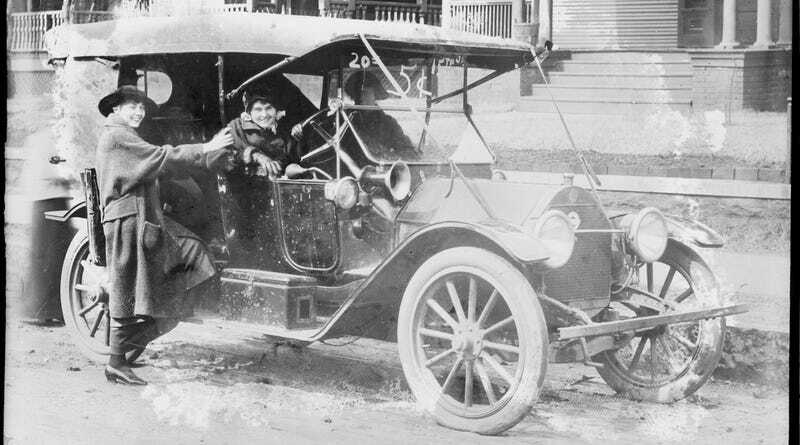 The very first known jitney driver took to the L.A. streets in the summer of 1914, and by 1915 there were about 700 jitney cars carrying 150,000 people per day around the city. But this disruption of the transportation industry didn't just stay contained to Los Angeles. The idea quickly swept the country, with jitney cars and buses popping up all around major cities in the U.S.
Needless to say, the established transportation companies (mainly in the form of railcars and trolleys) were not too happy about these wheel-bound disruptors. It took a few years, but thanks to a crackdown by the mayor, the jitney cars were pretty much non-existent in L.A. by 1918. Nationally, the jitney's numbers had been cut back by 90% that same year. It's still too soon to tell if ride-sharing apps like Uber, Lyft and Sidecar will meet the same fate as the jitney. But as we learn time and again, there's nothing new in Hollywood. You can read my entire story on the rise and fall of the jitney at Pacific Standard. Update: In an email from Uber, they point out that they signed an operating agreement with the California Public Utilities Commission explicitly stating that Uber services can operate statewide. On whether they'll comply with the cease-and-desist from the city of Los Angeles: "...the PUC has authorized us to operate statewide and we will continue to."